These questions stem from an analysis we have done of the way our FM radio spectrum is consumed in the UK. All things being equal, then approximately the same amount of this precious resource called “spectrum” should be consumed for each listener. But as we will see, things are far from equal. We’ve long harboured a suspicion that the BBC consumes an inordinate amount of FM spectrum in the UK. Particularly for local radio there seem to be numerous examples of excessively high powered transmitters on massive hills with huge masts. This gives a wonderfully strong and reliable signal, but an unfortunate side-effect is that they effectively sterilise that frequency over huge areas of the country – preventing it from being re-used for other services – hence the “no frequencies available” response that many new services get from Ofcom. One such example is Holme Moss, half a kilometre above sea level atop the Pennines. It broadcasts three “BBC Local” services from a further 168m up its mast at powers of 4000-5600 watts. It’s rather bizarre sitting in your student flat in Manchester being able to receive a clear stereo signal for Radio Leeds and Radio Sheffield – cities the other side of the Pennines. What a waste of FM spectrum resources! But maybe this is an isolated example and we have a distorted view? We need facts and figures to properly look at this. So we set-about getting some facts and figures – using the latest Ofcom FM database, and the Q12015 RAJAR figures. In the UK there are 205 available FM channels for FM services. 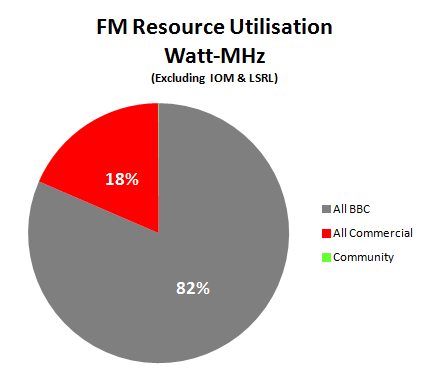 The Ofcom database indicates that there are 1918 licensed FM transmitters using those channels – meaning that on average each channel is re-used 9.4 times up and down the country. In actual fact some channels are re-used more than this, and some substantially less (see our previous analysis). The power of these transmitters ranges from 0.05 Watts to 125,000 Watts, and they are broadcast from sites ranging from 1 to 1097 metres above sea level with masts from 3 to 305 metres in height. Each transmitter (presuming it is stereo) uses approximately one quarter of a MHz of radio spectrum. To compare the FM spectrum consumption of each transmitter, we chose the unit MHz-Watt. That’s not MHz per Watt – its MHz times Watts. Just like your electricity meter measures your consumption in Watt-Hours. Note:- We also tried MHz-Watt-Metres but found that although it changed the figures, it did not significantly change the results. Use of Metres would also have led to difficult questions – should it be the height of the mast, or the height above sea level, or both combined? In actual fact whichever metres figure was used it did not change the outcome. So analysis of the Ofcom database yields this top-line result of how our UK FM spectrum resources are consumed. In short BBC consumes 81%, Commercial Radio consumes 18% and Community Radio consumes only 0.06%. 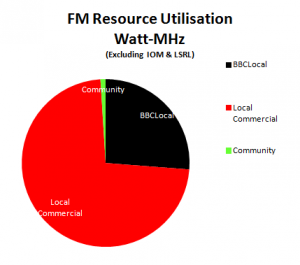 We can split that down and look at some of the detail – it turns out that BBC Local services do not consume nearly so much spectrum as we had imagined (8.9% versus 8.1% for local commercial services). If we tried an imaginary scenario where all national services vacated the FM band the split would look like this. Community radio at last starts to become visible, but would still be tiny. But of course this does not tell the whole story because it does not factor in how many listeners each station has. Perhaps the Community Radio share of the FM cake is so small because they have so few listeners? And vice versa for the BBC national stations? So now we use a new metric to also take into account each station’s Reach (000’s) as declared in the Q1 2015 RAJAR results. The unit is Watt-MHz/Reach 000’s. The result you will see is both surprising and unsurprising. 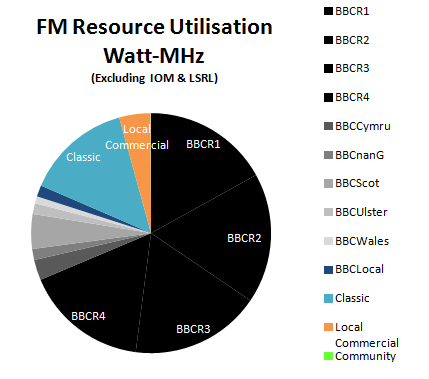 Radio Cymru consumes most FM spectrum per listener (1123 Watt-MHz per 1000 listeners) – but considering the low population density, and difficulty of Welsh terrain, then this does not seem very surprising. The consumption per listener of Local vs National radio is interesting – no doubt driven by geographic/population targets for national stations that don’t apply for local services? The stand-out figure has got to be Community Radio though at only 0.8 Watt-MHz per 1000 listeners. 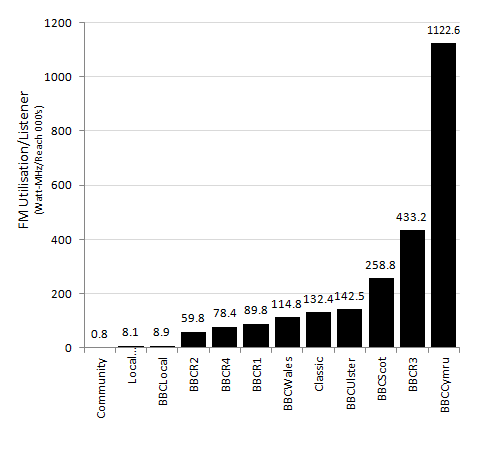 Admittedly it uses the “Other Radio” RAJAR figure which may over-estimate their share – but even if it over estimates their share by 4 times, Community Radio still consumes half the amount of FM spectrum per listener as BBC and Commercial local radio – and as you will see – 1400 times less per listener than Radio Cymru! This entry was posted in Uncategorized on July 10, 2015 by radiohead.